This Spring Color Palette NEEDS to be on Your Radar! In the interior design world, color is everything. Each season, a new color palette strives to inspire designers and interior design lovers alike, and we are obsessing over this spring color palette put together by the 2017 Style Spotters and Steelyard Access. 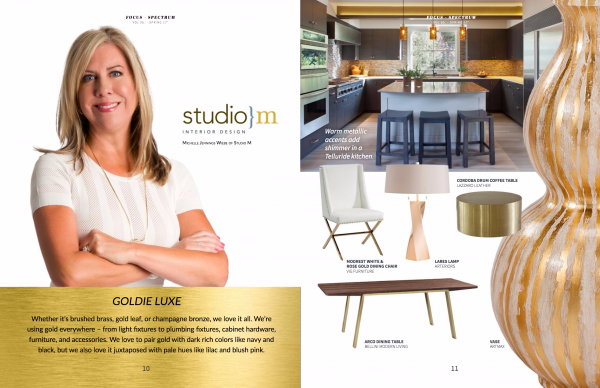 In the newest edition of the Steelyard Access Focus online magazine, each High Point Market Style Spotter was asked to pick a color and name that represented their brand. Our pick? Goldie Luxe of course! This color blended beautifully with picks from the other 2017 Style Spotter duo teams to create a spring palette of fresh, modern colors that flow together perfectly. Sign Up Now and Get a Free Copy of Michelle's Must-Have Paint Colors For A "Coastal Cool" Vibe! Visit Michelle Jennings Wiebe's profile on Pinterest.